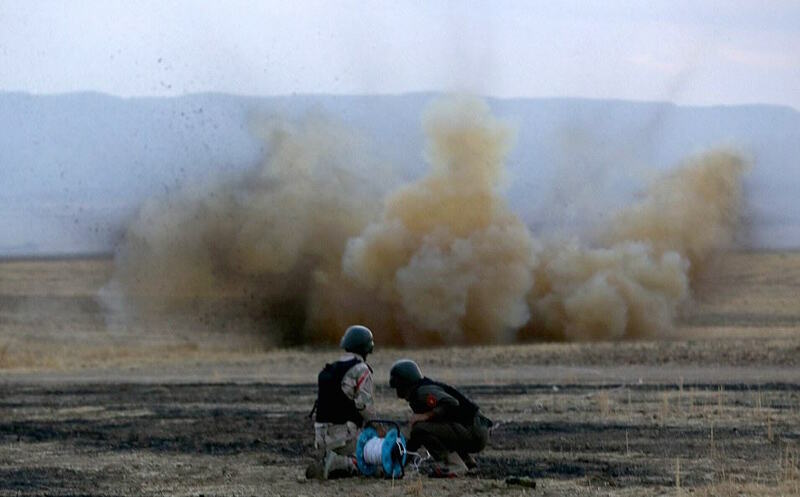 Millions of people across dangerous parts of Iraq and Syria face the heavy risk of being killed by deadly hidden bombs left by Isis. But as this shocking footage shows, it’s not only us humans who face this horrific threat. 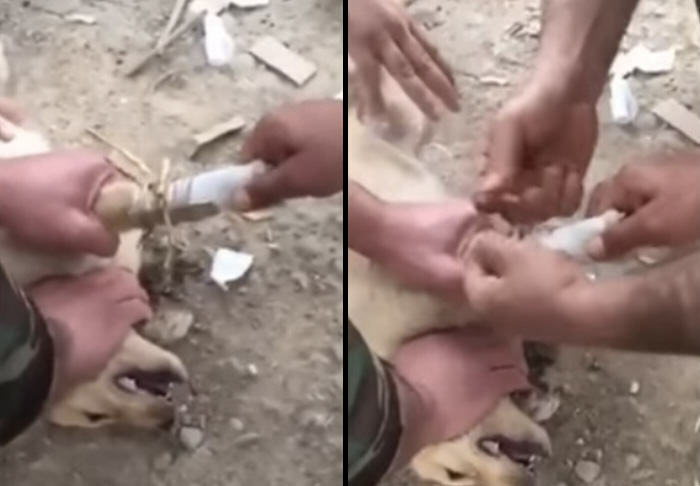 The clip – which we believe was filmed on a mobile phone – shows some caring soldiers perform first aid on a puppy. 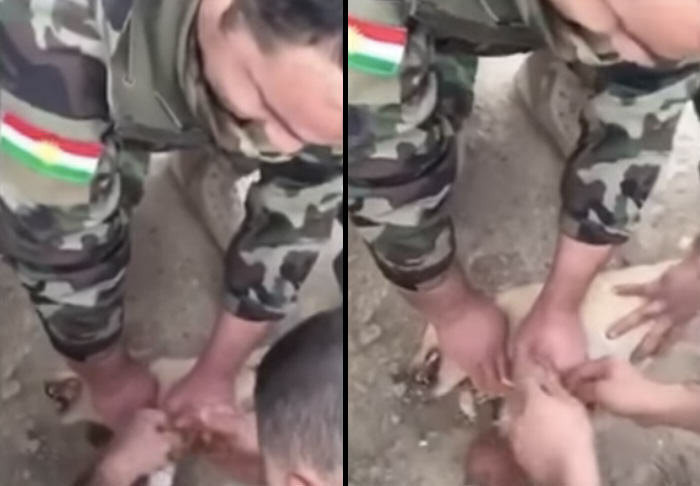 The soldiers – who are a part of the Kurdish Peshmerga military forces – are seen holding down the dog as they attempt to bandage it up. 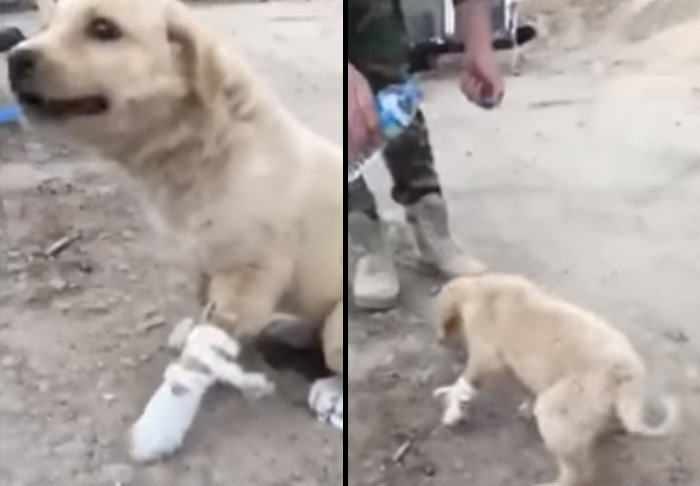 The animal is believed to have been working as an army dog and had its leg broken after its paw was almost blown off by a mine left by Isis in Iraq. The men struggle to help the pup as it would snap or bite them if they tried to help. But when the dog walked, it made unusual sounds as it may be in much pain. So they had to hold the puppy down and carefully tie the broken leg. While they carry out the procedure you can clearly see the dog is in agony as it squeals repeatedly. But it seems to be a happy ending as the soldiers finish their handy vet work and the pup is able to walk about afterwards. Iraqis and aid workers face an uphill struggle to keep to children safe from this sophisticated, hidden threat and mine detection dogs are used to sniff them out before they’re carefully removed.